Sweden could use weapons on suspect sub Jump to media player The deputy chief of joint operations in the search for the a suspected foreign submarine in Sweden says they "hate the fact there is something in our waters". The deputy chief of joint operations in the search for the a suspected foreign submarine in Sweden says they "hate the fact there is something in our waters". Sweden has been searching for several days for the unidentified object in their waters, but there are suspicions it is a Russian vessel. Rear Admiral Anders Grenstad encouraged the public in Sweden to take photographs if they see anything unusual in the water. He confirmed that if they found the suspect presence the "captain of the ship has the possibility to use weapons to get it to stop". 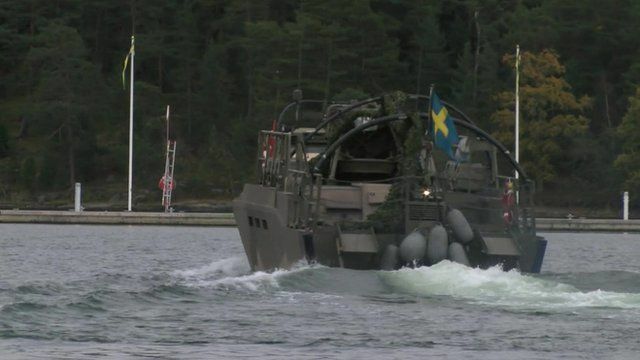 Go to next video: 'Foreign activity' in Swedish waters?